Click the button below to add the BOOGIE NIGHTS! Girls Gymnastics Leotard: Yellow & Pink Foil - FREE SHIPPING and Free Scrunchie! to your wish list. Introducing the Boogie Nights girls gymnastics leotard! This dazzling, high-energy gymnastics leotard is guaranteed to turn heads at the gym, on the podium or at the roller rink. Radiant yellow/pink tricot fabric gives this one-of-a-kind gymnastics leotard its unique, eye-catching look. This statement-making leotard is designed to meet the highest quality and performance standards. Each Boogie Nights leotard provides the gymnast with long-lasting comfort and durability. Every genuine Boogie Nights girls gymnastics leotard is hand-sewn in the USA from the finest nylon spandex 4-way stretch material featuring rich craftsmanship and precision detailing. The eye-popping design of this stunning leotard will give every winning gymnast an unbeatable combination of confidence, comfort and style. Add a little boogie to your workouts! 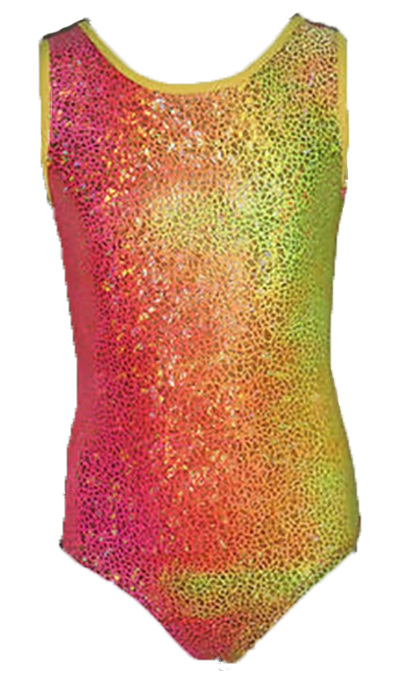 Order your new Boogie Nights gymnastics leotard today! IMPORTANT Please allow 10-12 Business Days before item is shipped (may ship sooner). Back features a cute criss-cross heart shape! Girls Pink Foil Crackle Gymnastics Leotard - FREE Scrunchie!